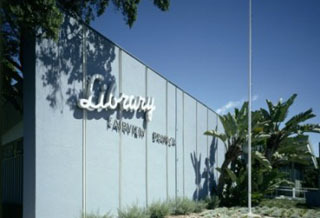 The Fairview Branch Library is located at the corner of Ocean Park Blvd. and 21st Street. By Freeway. Take the I-10 freeway to the Cloverfield Blvd. exit. Take Cloverfield Blvd. south for 0.8 miles and then turn right on Ocean Park Blvd. By Bus. The Fairview Branch Library is served by the Big Blue Bus lines 8, 16, and 44. Limited metered parking is available behind the Branch off 21st Street. Residential parking permits are in effect on the side streets north of Ocean Park Blvd. Monday thru Friday. Bike Racks. Cyclists can secure their bikes at the bike rack adjacent to and east of the main entrance facing Ocean Park Blvd. Fairview – Exterior Materials Returns – Two returns are located on Ocean Park Boulevard on the sidewalk near the Library entrance. These returns are available 24 hours a day, seven days a week, and accept books, magazines and audiovisual materials. Please do not drop donations into these returns. All donations should be brought to the Main Library, 601 Santa Monica Blvd. Children. The Fairview Branch offers storytimes and craft programs, book club gatherings, class visits and much more. Teens. Take advantage of our Youth Technology Center, after-school homework help, and community volunteer opportunities (8th grade and up). Adults. Enjoy our weekly current events discussion and writing workshop, as well as our Book Group which meets the second Saturday of the month, as well as author talks, workshops, movie screenings and other cultural and educational programming. En Espanol. Ofrecemos cuentos para los ninos, libros y audiolibros en espanol, y clases de computacion. Community Room.A 67-person capacity meeting room is available for rent for meetings or programs that are free and open to the public. Computers. The Fairview Branch Library is equipped with 8 public access Internet stations. The first Fairview Branch was opened in 1931 on 20th Street and was only 15 feet wide. In 1942, this store front library was replaced by a new building located at 2030 Pico Boulevard. In 1956, the Fairview Branch Library moved to its present location. During the war years, the population of the southeastern area of Santa Monica had grown dramatically due to the defense industry boom at Douglas Aircraft. The influx remained in Santa Monica following the war's end and the return of servicemen and women eager to start families. Designed by architect Weldon Fulton, it is a classic mid-century modern building. The original furnishings came from Eames, Knoll Associates, and Remington Rand. A community room was added in 1978 and other facility improvements were made in 2002. The current building size is 7,735 square feet.